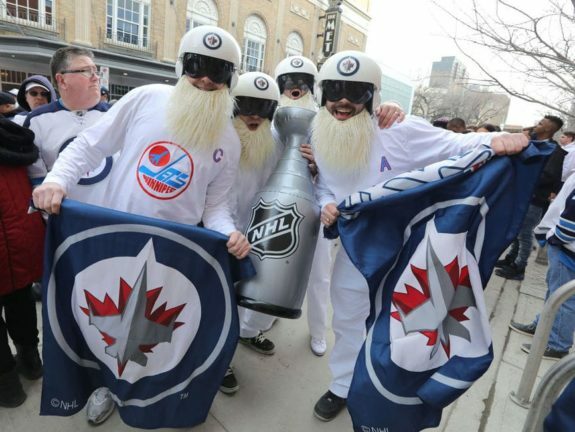 Spring has sprung in Winnipeg, but the Jets and their fans are gearing up for the Whiteout that’s looming on the horizon. 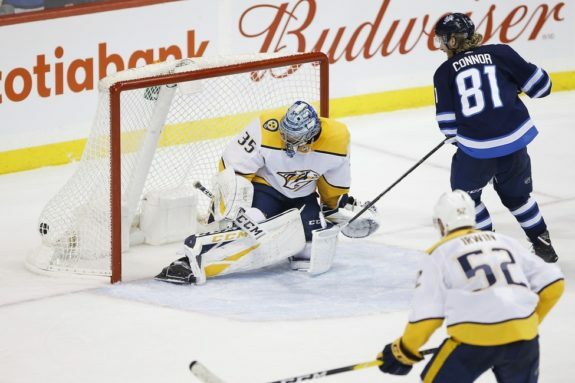 With their dominant, near-surgical 5-0 win over the Nashville Predators on Saturday, the Jets clinched a playoff berth for their third time since relocating from Atlanta in 2011 and ensured Winnipeg would continue seeing white despite melting snow and soaring temperatures. The Winnipeg Whiteout first made the prairie city a hostile, intimidating place for opponents more than 30 years ago. The tradition dates back to 1987, when Winnipeg marketing-man Ron Paulson came up with a strategy to respond to their first-round opponent Calgary Flames’ “C of Red” campaign. So while Winnipeg didn’t invent the idea of postseason colour coordination, they certainly perfected it. When the current incarnation of the Jets qualified for the playoffs for the first time in 2015, fans continued the tradition. However, the Whiteout couldn’t blind the Anaheim Ducks, who swept the Jets four games to zero. It wasn’t until 2018 that the Whiteout truly took Winnipeg by storm and achieved all-out, raging blizzard status. Last season, the Jets’ patient draft-and-develop strategy finally paid dividends as the team captured 52 wins, 114 points, and finished second in the ultra-competitive Central Division. For the first time, the blizzard raged not just inside the arena, but in the streets as well. To help their fans to celebrate the historic season as a community and to thank them for staying loyal through trying times, True North Sports & Entertainment and Economic Development Winnipeg threw the first-ever Winnipeg Whiteout Street Party for Game 1 of the first-round matchup against the Minnesota Wild. The response from Winnipeggers was nothing short of jaw-dropping. Thousands took to the streets and stood shoulder to shoulder, clad in all-white garb that ranged from Heritage Classic jerseys and Whiteout merchandise to outlandish apparel such as afro wigs, pilots’ helmets, snowmobile suits, Elvis jumpsuits, Guy Fawkes masks, chef’s coats, yeti costumes, and even wedding dresses. 5,000 fans attended the first party, but they only represented the start of the storm system. 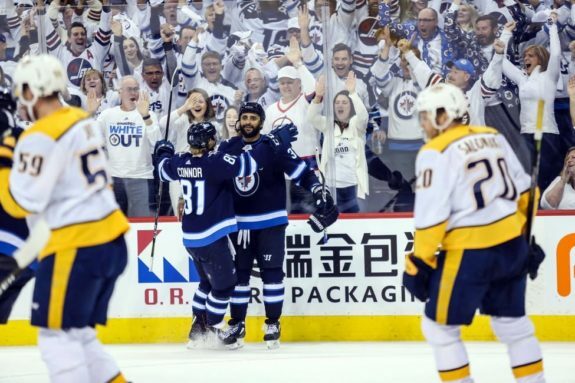 By Round 2 — a highly-hyped matchup between the juggernaut Jets and powerful Predators — the attendance more than tripled to 18,000; the party’s footprint kept expanding in an attempt to accommodate everyone. 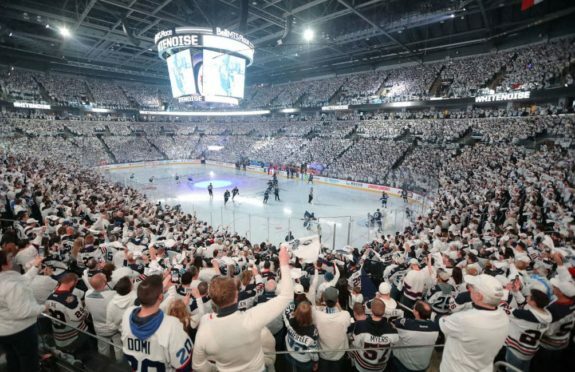 The Whiteout parties and the atmosphere in and around Bell MTS Place during the Jets’ playoff run — which was cut short when the Vegas Golden Knights conquered the Jets in five games in the Western Conference Final — was simply an incredible experience. The parties united Winnipeggers of all genders, ages, races, and economic circumstances. They allowed everyone — especially those who couldn’t get their white-gloved hands on or couldn’t afford playoff tickets — to experience the jubilation that comes with celebrating a big goal or a great save among thousands of their peers. Civic pride jumped to an all-time high level and thrust Winnipeg into the national spotlight, allowing it to be known for more than potholes and property crime. The Whiteout Parties will return this spring, and should be better than ever given that the first phase of True North Square — a burgeoning, multi-towered mixed-use development featuring a large gathering area — is now open. The atmosphere inside Bell MTS Place should be raucous as well, if recent games are any indication. Earlier in the month, we explored how Bell MTS Place has been noticeably tamer this season compared to seasons past. The lack of noise was also something local media noted, including the Winnipeg Free Press’ Mike McIntyre. However, the building was as electric Saturday night versus the Predators and exuded playoff-type vibes for the first time all season. The decibel level exceeded 110 at times, (the writer did his part to contribute to that number) chants of “first in Central” rained down as the Jets pulled four points ahead of the Predators with a game in hand, and the fans went into a frenzy when Kyle Connor completed his first-career hat trick with nine seconds left. Kyle Connor scored two filthy goals and then ripped home a third with just nine seconds left. All three of his tallies sent fans into a frenzy. Hellebuyck is right. The atmosphere was similar in Monday night’s matchup against the Dallas Stars, although the fans understandably deflated after the Stars — who the Jets would face in Round 1 if the playoffs began today — notched three consecutive second-period goals. The author has personally seen plenty of folk rocking Whiteout gear and assorted bric-a-brac in house windows and storefronts over the past few days. 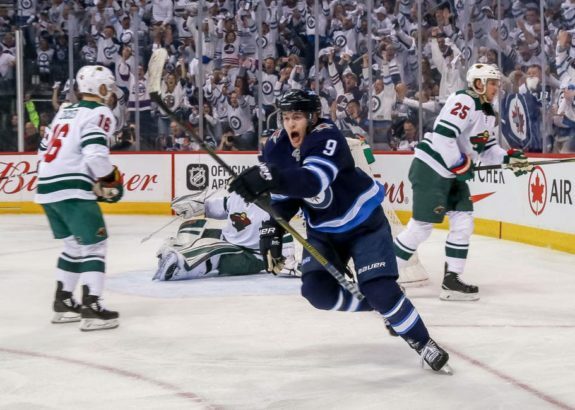 Despite the 5-2 loss to the Stars Monday night — where the Jets couldn’t capture the same emotional intensity they had Saturday — fans have had a lot of reasons to cheer lately. The club appears to be rounding into form at the perfect time after a very trying February. Since a heartbreaking, last-second loss to the San Jose Sharks on March 12, the Jets have won five of seven. They came out on top against heady, elite opponents in the Boston Bruins, Calgary Flames, and Predators. They also captured sturdy, defensively sound victories against the Los Angeles Kings and Anaheim Ducks on their three-game West Coast road trip last week. Deadline-day addition Kevin Hayes is fitting in well and has 11 points in 14 games since joining the team. Kyle Connor is white-hot and was just named the NHL’s First Star of the Week and has 10 points in his last five games. Prior to his Monday goal, Patrik Laine hadn’t scored in a dozen games, but has been invaluable nonetheless for his passing ability and heightened compete level. Hellebuyck is 4-1-0 in his last five starts with a pair of shutouts, Tyler Myers is eating up huge minutes and is having a strong season after a terrible first two months, and injured D-men Josh Morrissey and Dustin Byfuglien are getting closer to returning to the fold. Byfuglien took Monday’s morning skate in a non-contact jersey. If the Jets can keep the positives going through their last six games, they will be in good position to keep the Whiteout raging for just as long — if not longer — this spring than last. This will be a Whiteout no Winnipegger will complain about, especially if the impending storm blows a Stanley Cup into town. Opponents should batten down their hatches, because a true storm (sorry, Carolina. Your “surge” is a warm summer breeze in comparison) is coming soon. 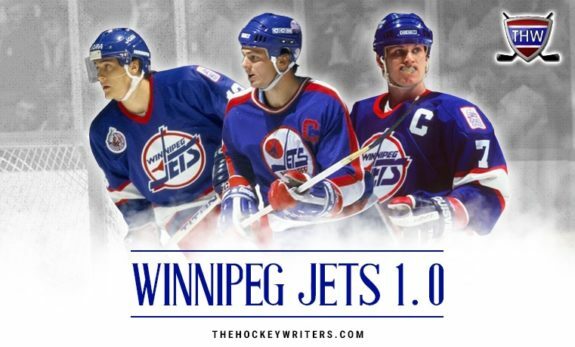 Subscribe to Our FREE Jets Newsletter!